I love preserved lemons and never realized they were SO easy to make at home. Wash lemons in soapy water if you think they might have been sprayed, rinse clean. Cut lemons into quarters. Use as wedges or don't cut all the way through and keep each lemon together. I cut mine so I could fit more in the jar. Squeeze a bit of juice from each quarter over a bowl and cover generously with salt and place in the jar - let extra salt fall into the bowl as you'll put it in the jar too. When jar is full add ¼ cup more salt and fill jar to top with freshly squeezed lemon juice. Tighten lid and leave on counter top for 3-4 weeks, then place in the refrigerator. Will keep in fridge up to 6 months or longer. 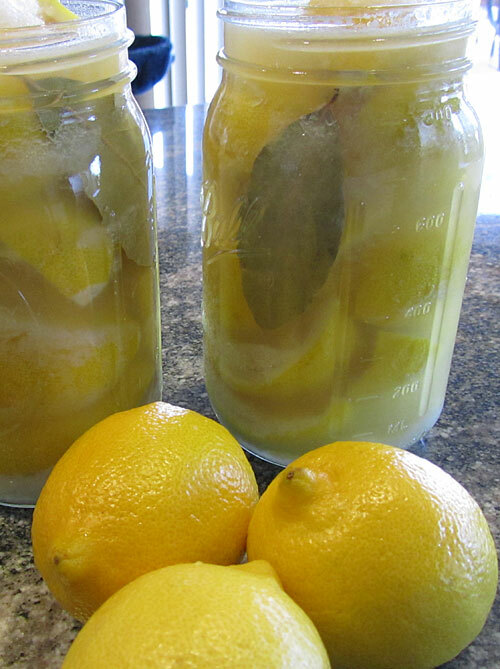 Seriously, if you've purchased and used preserved lemons, try making them yourself. It's so easy and they look beautiful sitting in the jar!